(Monday, April 07, 2009) Ace Frehley has issued his first video blog (click below) offering up samples of "Genghis Khan" and "Foxy And Free," tracks off his forth-coming CD "Anomaly." These add to his taste of "Pain In The Neck" featured earlier. (Thursday, January 29, 2009) This cool Ace Frehley art, by Per Thomas, was included in an article "Does Classic Rock?," in Bremen, Germany newspaper "Weser Kurier" on January, 28. Thanks to Juern Schulze for sharing it with us! (Monday, January 05, 2009) Ace has debuted the artwork for his forthcoming album, "Anomaly." Reminder: Ace on "That Metal Show." (Saturday, December 20, 2008) Ace will be included on tonight's VH-1 Classic "That Metal Show," hosted by Eddie Trunk. There should be plenty of repeats should you miss the 11pm broadcast. Most importantly, Ace discussed the new album, and had artwork for the CD with him. The title of the album apparently is not going to be "Pain In The Neck," and it and the artwork will be revealed on Ace's website sometime in early January. The stage the album has reached is "tweaking," though one song remains to be remixed in January. The essence Ace and Derrek presented is that they've been working hard on the album and that it's nearly ready. Good news for Ace fans! (Thursday, December 18, 2008) Ace and guitarist Derrek Hawkins will be on Q104.3's Original Merry KISSmas show this Friday 11pm-1am. Check it out online at www.q1043.com. Host Eddie Trunk has a news report Here. (Tuesday, December 16, 2008) Here's a cool interview with Ace, by Eddie Trunk, from earlier in the year (in case you missed it). "I'm happy to say that I finally got a good internet connection up here on Jendell and can now present to you my official website- AceFrehley.com! Thanks for your patience and support over the years... it's meant everything to me. Now, let's ROCK!! AceFrehley.com is going to provide a link between us & be something unique & different from the "usual" website. What you will see is exclusive pictures & video clips from my archives, news, tour dates & appearances announced here first, and a chance for you to be a part of this website by sending me your photos & questions. I'll be emailing all my members very cool "extra stuff," so don't forget to sign up! And despite the rumors, you'll be hearing my new cd real soon... Stay Tuned. I hope you have as much fun on AceFrehley.com as I've had putting it together." Ace Ready To Launch Official Website? (Thursday, December 4, 2008) It appears that Ace will be launching an official website, www.acefrehley.com on December 15, 2008. A "whois" lookup indicates that the site is being developed by despro.com. More new Ace Frehley song-titles..
(Thursday, November 06, 2008) Ace will be appearing at the Rock and Roll Hall of Fame and Museum's American Music Masters series celebrating Les Paul on Tuesday, November 11 as part of "The Gibson Sound: A Night with Henry Juszkiewicz." Ace "will talk about playing guitar and demonstrate some of his signature riffs" while "Henry Juszkiewicz, Chairman and CEO of Gibson Guitar, will take the audience through the story of Gibson Guitar, its history and leadership in music innovation while highlighting the company's more than 50-year history with Les Paul, and the guitar that bears Les's name." This event is free with a reservation. Email education@rockhall.org or call 216.515.8426 to RSVP. (Thursday, November 06, 2008) Eddie Trunk has provided an update on the state of Ace's album: Now that we have a firm release date for the new G&R CD, one of the most popular questions I get through this site and on the radio shows is "wheres the new Ace album"? Ace has been asking me to come to his home studio and give him my thoughts on what he is working on for a few months, but with my schedule and upcoming TV show on VH1 Classic its been a little hard to free up the time. Well I finally made the trip to his place in Westchester NY yesterday and we had a great time as always. Ace has been a close friend for over 20 years now and was the first artist I ever signed and worked with at a label in the 80's. Amazingly he has not done a new CD since. Obviously much has gone on in his life since Trouble Walkin, Kiss reunions, career ups and downs, and most importantly he got sober. Another huge thing that has happened is a radical change in the music business and how people make and market records and how many they can sell. Ace knows he can trust me and knows I will give it to him straight, which is why he really wanted me to come and help him make some decisions on what to do next and hear where he's at with a CD he has been talking about for years. Ace lives in the woods of Westchester NY. A really nice country area. There are a couple houses and his studio on the property. The studio is a converted barn. A really cool place to say the least. The studio is a very lived in rock and roll place. Original Kiss gold and platinum records are on the walls, many falling apart in the frame due to being over 30 years old. Still cool and authentic. Other Kiss/Ace memorabilia from the years is all over the place, including stuff from the reunion and some of Ace's Kiss stage clothing. Ace has been a close friend forever, but it's still so cool as a fan to take all this in and go back in time. We even looked at some photos from the 80's and early 90's from the original solo bands and tours and it brought back many memories! Needless to say there are guitars and instruments all around and a really cool main control room to the studio with the latest computer recording equipment. Ace was one of the first guys I ever knew really into computers, so it's natural he has fully embraced it for recording. As for the music. I first heard 3 songs Ace was mixing about a year ago at a studio in NYC. All sounded good to me but obviously I hadn't lived with them like Ace has. He now has about 15 total songs, 6 of which have been mixed by two different people. Jay Messina, who has worked with Kiss and Aerosmith to name a few in the past, and Mchael Barbiero, best know for the production team in the 80's of Thompson/Barbiero (Tesla, G&R) also mixed some stuff. There are also many songs not mixed, some not complete, and some still being written. You can already see where the delays are. This is an album in several phases of completion. If he wanted to put out a 5 song EP it's pretty much done, but the challenge is figuring out the direction he wants the album to be, what songs make it, and what mixes. Some of the songs I heard include "Sister", which has been around for years and was played live, "Pain In The Neck", which Ace said could be the albums title, "Gehnghis Kahn", which may be an instrumental, and my favorite so far,"Change The World", which has a very heavy Beatles vibe. As far as the direction, the album is more in line with classic Kiss than anything that has been on any original members solo releases thus far. Gene's last album was a little quirky and all over the map, Paul's glossy and pop leaning, Peter's more ballads and standards influenced. This is straight down the middle, in your face, loud guitars, hard rock. Exactly what Kiss fans would expect. I urged Ace to make a CD for him and his fans, not to follow trends. It was important I stressed to him that the days of having a hit record are likely over. Nothing to do with material, just the reality of the business now for classic based artists (of course I'd love to be wrong!). The guitars sounded great on what I heard and Ace's playing was in top form. He sings lead on all the songs, is producing the record and wrote everything. The band on the recordings is his current touring band. Most striking to me about what I heard was Ace's voice. It has never sounded better on record. Clean and in that high register, with the Ace attitude. He credited this to his sobriety, as well as the quality of his playing. All in all what I heard is very promising, but I would not expect it to be released anytime soon. Ace still has some questions to answer about this material, what will make the CD, what it will sound like, and he is still getting new song ideas which is making him rethink things. When you have your own home studio, no label telling you deadlines, and the demand from the fans that want an Ace album as good as the first Frehley's Comet or Touble Walkin (or of course the '78 all time classic!). there is no release date except for when Ace feels its ready. He also has some interest from a few labels and has to decide if he wants to go that route or do what many artists are now doing and sell direct. He also needs to get up an offical website. So there is still much to do on the business and recording fronts, and again, no deadline but his own. He understands fans are frustrated and want new music from him, but until he thinks it right its not coming out. I am helping him where I can and can tell you I really think it will make Kiss fans and Ace fans happy when it does come out but the release is not imminent in my judgement. After the studio we went to dinner and caught up on all sorts of stuff. For me personally I am most proud of the man Ace has become the last few years. He is sober, logical, and reflective about his career. Very simply, he now "gets it" and is a survivor to say the least. I've seen everything over the decades with the guy, but I am most proud for the changes he made in his lifestyle. If he stays focused, maybe brings in an outside producer, finds a manager he likes (all things he's considering) and maybe makes some personal deadlines we might see this sometime next year. But again, don't hold me to that. It all depends on how he's feeling about things. Trust me when I say that it exists, it rocks, and I think Kiss/Ace fans will love it when its ready if he stays on track. I of course will keep you posted." (Thursday, October 16, 2008) Rich Circell was lead singer in Honey, a band Ace played with around 1968/9. Little was known about it... Until now! KISSFAQ.com: Tell us a little of your background and how you became interested in performing? Like many others it was The Beatles on Ed Sullivan that did it for me. I knew I had to form a band and have all those girls screaming for me. KISSFAQ.com: What was the first record you bought? I remember buying Runaround Sue and then Four Seasons records. I loved the girl groups too, like The Ronettes. KISSFAQ.com: What was the first band you saw live? I saw The Beatles at Shea Stadium but I was very far away and could not really hear them. When I was older the one show that stands out in my mind was seeing The Who and Cream at a Murray The K show in New York. Mithch Ryder and Wilson Pickett were also on the bill. I also saw Jimi Hendrix open for The Monkees at Forest Hills-that was a classic. All those Monkey fans did not know what to make of Hendrix. KISSFAQ.com: You were the vocalist in Honey. How did you become a singer and did/do you play any instruments? I just picked it up on my own and by listening to records. I would say I was most influenced by The British Bands. One major regret I have was never playing an instrument. Of course I fooled around with tambourines, cowbwells, conga drums, etc. KISSFAQ.com: What do you recall of your first band? My first band was called The Wrong - I never liked the name, just as I never liked Honey as a name either. If I remeber correctly Honey was Paul's idea and everyone kind of went along with the name. Getting back to my previous band, my drummer ended up in Honey and on certain dates my keyboard player also. We played all the British Invasion stuff and did write several originals. We did some recording with the person who was handling The Lemon Pipers and Steam. To my knowledge none of those demos exist. I would love to hear them today. KISSFAQ.com: From first becoming active in bands, what was the sort of timeframe prior to Honey and when was that band active? 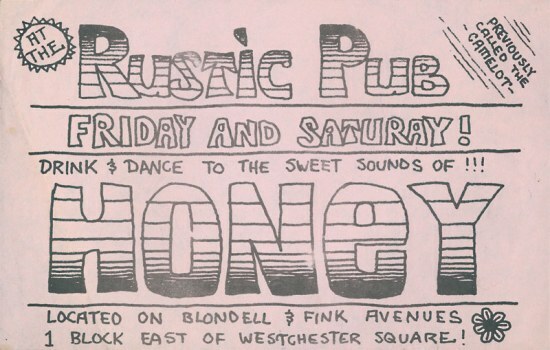 I was in several bands right up to joining Honey, but I must admit the timeframe is a bit of a blur. The Wrong was my band right up till the time of joining Honey - I hope that helps. KISSFAQ.com: Had you known Paul Frehley prior to being in Honey? If so, how? KISSFAQ.com: What do you recall of your first encounter with Paul Frehley? It was very interesting to say the least. I had heard through the grapevine that a band in The Bronx was looking for a singer, so I showed up for an audition in somebody's basement. Paul asked me to sing a few Rolling Stones songs and maybe even a Humble Pie tune although I'm not sure on that last one. At the end of playing together for awhile he turns and says to me - we are playing in a club on Friday and that was pretty much it. I guess that was his way of saying I was in his band. KISSFAQ.com: Did you have any lasting first impression about him? He was a man of few words, but his guitar playing was awesome. He could play any lead or solo note for note. He would always stand close to me onstage with his guitar slung very low. He had the look of a rock star, and the chops to back it up. KISSFAQ.com: What happened to Honey's second guitarist? I think we pretty much phased him out, although I liked the sound of the 2 guitars. KISSFAQ.com: What sort of music and where did Honey play? We played many local clubs in the New york area. Our set consisted of many British bands music. Here is a list as I remember it. Jumping Jack Flash, Brown Sugar, Street Fighting Man and many other Stones tunes. Several Jethro Tull songs, I don't remember the exact titles. Zeppelin, The Who and Hello Susie by The Move. We did an Alice Cooper medley featuring Be My Lover and Eighteen. One of our favorites was Come On Up by The Rascals, of course we did our own version. We also did some Nazz including Not Wrong Long and Under The Ice. Vanilla Fudge-Keep Me Hanging On. A few clubs that stand out in my mind are The Rustic Pub in the Bronx. Fantasy East which was near 238 St in The Bronx, and The Fore and Aft in New Rochelle. KISSFAQ.com: What sort of guitarist was Ace at this time? I will say that Ace was a super guitarist even then. Very innovative and he would hear something once and play it perfectly. Even then he marched to his own drum. KISSFAQ.com: Who else was in Honey? On band members I remember we originally had a second guitar player named Tom, but I can't recall his last name. Our bass player was Tom, and his last name may have been Stella. Our drummer was Angelo DiGeronimo and I sang lead- my name is Rich Circell. We were joined for awhile by a keyboard player named Lee McNulty. KISSFAQ.com: What do you recall of the first Honey gig? I felt at the time like I was just along for the ride. We went over well but we knew we had to tighten things up. We had a limited set list at that time. KISSFAQ.com: Describe Honey's best gig? Where/how/what/why? I guess this means most memorable! I would say one we did at the Fantasy East in The Bronx was the one I really remember. The sound and song selection was great. We did our usual stuff but with some James Gang thrown in. I remember the crowd was really into it and lots of people took pictures. KISSFAQ.com: Did Honey ever open for bigger bands or play gigs with other acts? KISSFAQ.com: Do you recall any disasterous Honey gigs? One which stands out in my mind was when our bass player threatened bodily harm to Ace. It seems Ace wanted to be in a new position on stage and had moved the bass players equipment without asking him. That did not go over well and I was asked to be the go between. This guy would have killed Ace for sure. We ended up playing but you could feel the tension all night long. KISSFAQ.com: Did Honey ever record any of their gigs? Maybe on some old cassete players but I have never heard any of them if they exist. KISSFAQ.com: Did the band write any original material? If so, what sort of material was it and who were the primary writers? I wrote original material along with the keyboard player but we never performed it with Honey. KISSFAQ.com: What happened to Honey? Did the band break up, or Ace leave? I remember it getting to the point where nobody liked each other much any more and things really seemed to fall apart. KISSFAQ.com: Did you continue in bands? That was it for me. The music business had left a sour taste in my mouth. KISSFAQ.com: What word pops into your mind the moment you hear "Paul/Ace Frehley?" Unique. Strong willed and a non conformist. KISSFAQ.com: Did anything Ace later did in Kiss remind you of him in Honey? The way he held his guitar and some of his solos. KISSFAQ.com: Did you follow Ace's career and/or keep in touch with him? I had a conversation with him at a part about music and he was telling me about a new band that he would be getting involved with. He talked about high heels, makeup, spitting fire etc. I have never seen or spoken to Ace since. It has been a blast reliving these great old memories. I would not have traded the experience of playing with Honey for anything. It was a great period of time for me. Thanks for giving me the chance to share my story. Thanks to Rich for taking the time to read let alone answer this long Q&A!. (Wednesday, October 01, 2008) From the Chiller Site: "Attention! Ace Frehley will not be signing any guitars or pick guards and will be charging a fee for autographs (as do many of our guests)! Guests set their own prices for autographs (just in case you were about to ask us "how much?")". (Tuesday, September 22, 2008) Ace will be appearing at the Chiller Theatre Toy, Model, and Film Expo on October 25. Check the Site for details.